Vacuum tables built to your specification. 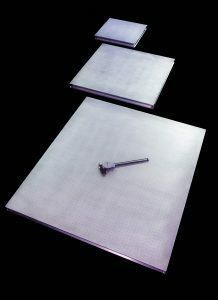 Vacuum tables are used in a multitude of commercial and industrial applications worldwide, coming in all shapes and sizes such as a small vacuum table to facilitate many processes. Small vacuum tables are used as a tabletop vacuum system and facilitate many processes on small parts. Holding very small parts still without any movement during cutting or milling can be tricky without the right type of vacuum table, table design and strategy. Here are a few tips to successfully use a smaller size vacuum table during cutting or working on small parts. You’ll want to evaluate the hole patterns, the need for a sacrificial layer, the overall strategy of your vacuum table process and be sure to use the right tools. Vacuum tables significantly improve many commercial and industrial process to improve the quality of various products and the efficiency of the process. Using a vacuum table to hold small parts securely in place is probably the best hold down method available. Using vacuum to hold small parts allows for easy access to cutting or milling while not allowing cut parts or pieces to go flying off the table and either damaging the parts or an employee. Small vacuum tables also provide a quick and efficient means of secure hold down, as vacuum can be controlled and instantly activated or deactivated, even in custom designed zones. Small vacuum tables are a critical component in many small part processes and adhering to the following tips will help to make your process successful. Vacuum tables should improve the quality of your products and the efficiency of your operation. Follow these tips when using small vacuum tables for product and process improvement. 1) Evaluate the vacuum hole patterns. Vacuum table hole patterns are typically in a standard size and pattern, although smaller parts may require a denser hole pattern. Dense hole patterns will hold smaller parts more firmly in place and prevent cut pieces or parts from flying off the table. Speak with your vacuum table manufacturer about the best hole pattern for your small part process. 2) Use a sacrificial layer. Using a sacrificial layer allows for precision cutting without milling into the vacuum table surface. Using the right type of sacrificial layer for your process is critical to achieving optimal results. Some sacrificial layers may be permeable to allow air flow while others have matching vacuum holes to sit right on top of the table. Each allows for optimum airflow and vacuum force while protecting the tabletop surface. If your sacrificial layer becomes damaged it is important to replace it to make sure your products will still a flat with the right amount of vacuum hold down force. Be sure to determine your strategy and how to best use your small vacuum table prior to beginning your process. You’ll want to know the right amount of cutting force to apply for quality results without damaging your sacrificial layer or vacuum tabletop surface. Developing the right strategy for your small part process will get the most value from your vacuum table while preventing scrapped or damaged product. 4) Use the right small vacuum table tools. Using the right tools with your small vacuum table is critical to preserving the quality of your table and your product. When working on smaller parts, it’s obvious that making smaller cops is generally the best approach while also conducting your cuts with a downcutting tool. A small, downcutting tool will push the material downward rather than pulling it up which will preserve your sacrificial layer and flat surface. For more information and tips on getting the most value from your small vacuum table, contact the knowledgeable engineers at Systematic Automation, the authority on vacuum table design, engineering and construction of vacuum table systems. Systematic Automation offers more than 35 years of experience in manufacturing quality vacuum tables in all shapes and sizes. Our vacuum systems range in size from small vacuum tables at 5” x 6” all the way up to 72” x 144”, with custom sizes available upon request. We set the industry standard for consistent flatness with +/-.001” per linear foot on all table sizes. Systematic Automation is a recognized authority on vacuum table solutions, with several engineering features and options available. We offer process analysis to ensure the right vacuum table for your application with ongoing customer support. Contact us to learn more about our proven vacuum solutions from large and small vacuum tables.